Are there any memories more vivid than those we have from our days spent in school? It’s where many of us made life-long friends, decided on a career path or met our spouse. Not all memories I have of school are good ones. I still remember my 6th grade teacher – Miss Pomeroy – who would whack her pointer stick on my desk when she’d catch me biting my nails (by-the-way, I don’t do that anymore). I came across my daughter’s year books recently while cleaning and had a sit-down to take a look through them. She was involved in lot activities and had a slew of nice friends. It made me wish I had discovered scrapbooking earlier, while the kids were in grade school. I could have put together cute little mini books for the grandparents rather than just send an envelope full of photos. 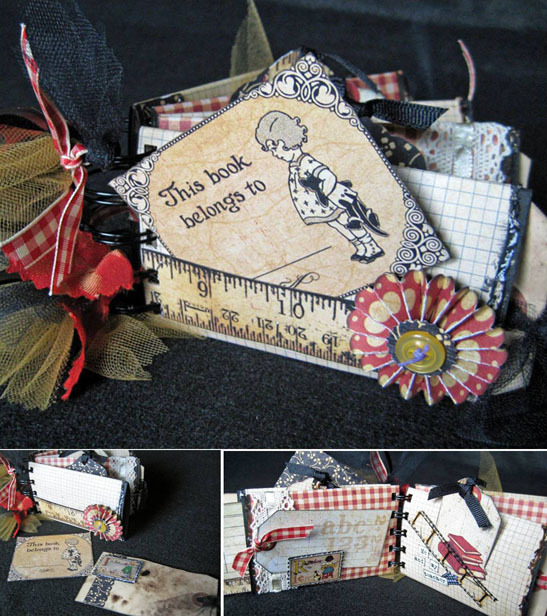 That’s what I had in mind while creating this little mini book for the back-to-school season. It’s small in size but big in personality with plenty of tags and nooks and crannies to hold a good amount of photos and journaling. The Graphic 45 ABC Primer collection of papers that were released recently were just the perfect fit for this adorable school-themed mini. Check my calendar often and watch for locations, dates and times for this class and others – I’ll be listing them soon! Isn’t it amazing ways have changed? If you could have had Mrs. Henson, you would have loved 5th grade at least! lol I had a “Miss Pomeroy” too – Mrs. Martin. Her specialties included yelling loudly and whacking us hard in the middle of the back. The current mayor of Livonia (Jack Kirksey) paddled me a number of times when I was in elementary school. I love your little book; I’ll bet it was fun to create! Miss Pomeroy??? At Hubert Elementary????? What a great mini album! I wish I had had one of these when I was in school for all of those small exchange photos!